DevTest Labs supports creating VMs based on Azure Marketplace images depending on how you have configured Azure Marketplace images to be used in your lab. This article shows you how to specify which, if any, Azure Marketplace images can be used when creating VMs in a lab. This ensures that your team only has access to the Marketplace images they need. On the lab's blade, select Configuration and policies. 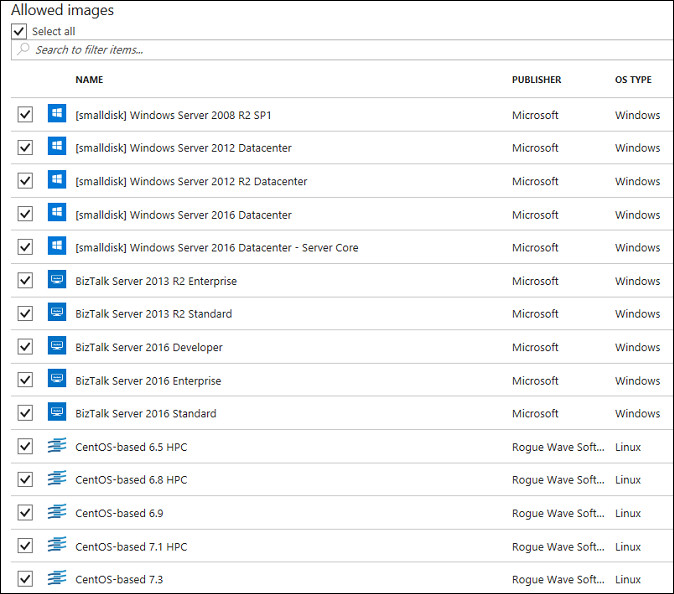 On lab's Configuration and policies blade under Virtual Machine Bases, select Marketplace images. If you want no images to be allowed, or you want to specify which images can be used, select No. If you select No to the previous step, the Allowed images/Select all checkbox is enabled. You can use this option together with the search box to quickly select or deselect all the items displayed in the list. Select the Azure Marketplace images you want to allow for VM creation individually by checking each image's corresponding checkbox. Select nothing from the list if you don't want to allow any Azure Marketplace images to be used in the lab. Once you have configured how Azure Marketplace images are allowed when creating a VM, the next step is to add a VM to your lab.